D E S I G N L O V E F E S T » OH HEY LOOK! ok. i know this looks like we got engaged at the mall. and as glamorous as that would be, it’s not the truth. yet. 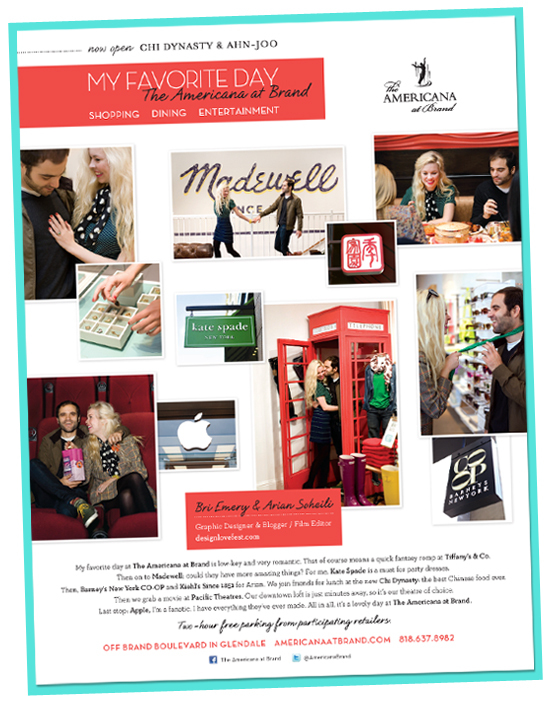 my boyfriend and i had fun shooting an ad for The Americana at Brand that appeared in the latest Los Angeles Magazine! here are some of the shots from the day! this is my oh hey, come here. i gotta show you somethin pose. 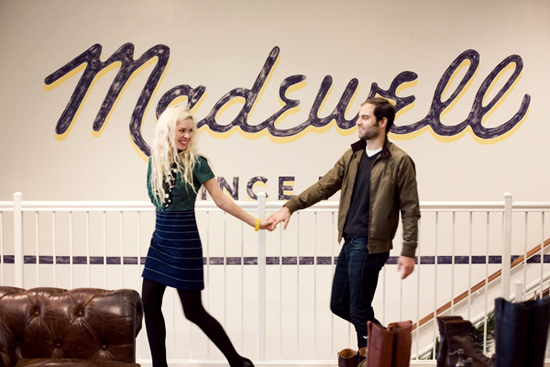 how great are those colorful stairs in Madewell? PLEASE someone do this in their house! i watched breakfast at tiffany’s for the first time last night. WOW. what the hell was i doing waiting so long to watch that? the colors! the tasseled ear plugs! 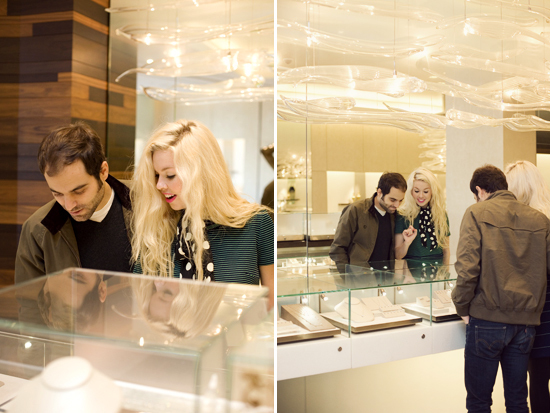 anyways, we are at tiffany & co here. Love the steps and it looks like you guys had fun! So cute!! I want to do something like this! These photos of you two are so pretty and happy. You make a beautiful couple! How fun! And no one told me there was a 2-story Madewell! for the first time??! no. way. that’s like my husband not seeing “sounds of music” – what world he grew up in, i have no idea. but you two are so adorable together. i love how happy you two look together too. i wish you both all the very best! I love the green and navy striped dress. Is it vintage from shareen? Breakfast at Tiffany’s: best movie ever. You two look great! A year ago, I watched Breakfast at Tiffany’s -for the first time-and I, too, wondered why I’d waited so long! Such a fun film. xo. Adorable! I’m ashamed to say I’ve never seen Breakfast at Tiffany’s. It’s been on my to-watch list forever. I agree witht the person who said your bf looks like the roommate from new girl! I was watching it the other day and your bf came to mind. so so SO cute, bri! What fun!! Those Madwell stairs are dope! They’re opening a store near me, can’t wait! The “hey come here” pic. It’s awesome. Yeah, I am pinning that! I heart those stairs something chronic. Would it be wrong to build some just for the purpose of painting them like that? Yes? Yes. It would. Ok, thanks for reinforcing that. Sigh. You two are adorable! Your man kind of looks like Jake M. Johnson from ‘New Girl”. Love this! So adorable. I love your polka scarf too. Amazing. Bri, Thank you for being part of the campaign. You two are so easy and fun to work with, I thought the ad turned out great, one of my favorites to date! Fun!! Madewell is such a fav. & Breakfast @ Tiffany’s is so lovely & colorful–the poster movie for Kate Spade, in my opinion! What a fun shoot, looks like you had lots of fun! I love, love, love your bright pink lipstick in all the photos! Heyaa i am fߋr tҺе first time here. helpful & іt helped mе оut а lot. ӏ’m hoping to ρresent something Ьack and aiid օthers like ƴοu aided mе.